Posted on April 26, 2017 at 9:55 am. 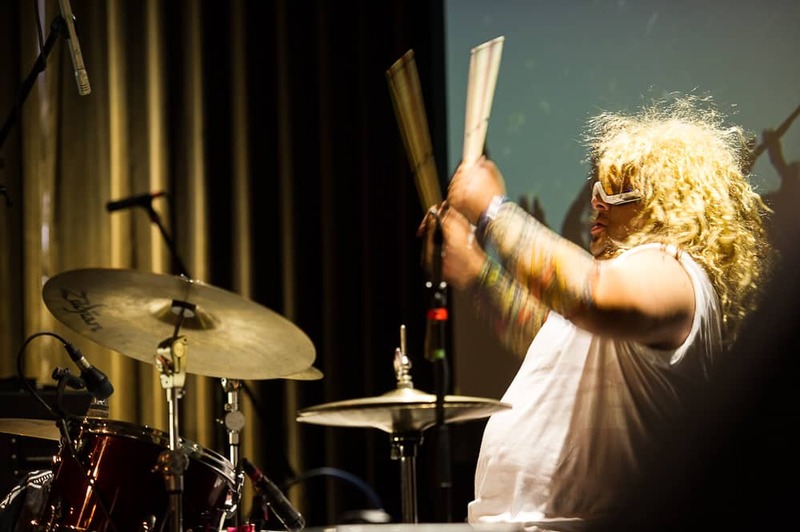 PORTLAND, ORE — On May 17 at the Crystal Ballroom, bankers, architects, lumberjacks and surgeons will represent their companies and compete for prizes at Battle of the Bands, a benefit for Work for Art. Tickets are $12, on sale now at the Crystal Ballroom box office at workforart.org/bob. A limited number of VIP tickets are available for $100 each, including reserved seating, and hosted food and beverages. Six bands, made up of employees who play music on the side, will compete in front of family, friends, coworkers and a panel of celebrity judges. Several prizes will be awarded including the title of Best Company Band. Audiences will select an “Audience Favorite” as determined by the band that receives the most in cash donations the night of the event. Doors open at 5:30 p.m. Food and beverages are available for purchase. As a warm-up act, Brothers Jam will perform until 6:30 p.m., featuring BodyVox artistic director Jamey Hampton. Valerie Day has been a vocalist and percussionist for many years beginning with the Grammy nominated group Nu Shooz in the 1980’s. She has toured extensively in the United States, Canada and Europe, appeared on national and international TV programs, sold over a million records worldwide, has sung with orchestras and performed at numerous music festivals. In addition to her life as a performer, Valerie had a private vocal studio for over 20 years. Rindy Ross is the lead singer, saxophonist, and co-founder of Quarterflash and The Trail Band, both bands she formed with her husband, Marv. Their platinum debut Quarterflash album produced the hit single, Harden My Heart, and they traveled extensively including tours with Elton John, Linda Ronstadt, Sammy Hagar and others. Since the Eighties they have released six Quarterflash and thirteen Trail Band albums and have been inducted into the Oregon Music Hall of Fame. Edna Vazquez is a Latin American artist based in the Northwest who performs original music that pays homage to her many influences from across the Americas. Edna has traveled far and wide with her band of all-star musicians to share their message of light, love and cultural healing. There will also be a special performance by Rock N Roll Camp for Girls’ Strawberry Jam, with band members ranging in age from 15 to 17 years. This opportunity is made possible by a sponsorship from The Standard. At approximately 8:30 p.m., while the judges deliberate and the cash is counted, the Portland Timbers Army band Greenhorn will perform. Timber Joey will be on hand to help announce the winners at the end of the evening. All proceeds from Battle of the Bands benefit Work for Art, an annual campaign to raise money and awareness for local arts and culture organizations. Battle of the Bands is sponsored by headliners Hampton Lumber, KeyBank, KINK 101.9 FM and The Standard. Additional sponsorship support is provided by Kaiser Permanente, Stoel Rives and ZGF Architects. Work for Art is a program of the Regional Arts & Culture Council (RACC), which distributes a full 100% of all Work for Art donations, including Battle of the Bands proceeds, to arts organizations in Clackamas, Multnomah and Washington Counties. For more information visit workforart.org.